Preface, 1. The ordering of English, 2. Literacy and politeness: the gentrification of English prose, 3. Testing the model, 4. Loose and periodic sentences, 5. Lofty language and low, 6. Nominal and oral styles: Johnson and Richardson, 7. The new rhetoric of 1748?93, 8. The instruments of literacy, 9. Politeness, feminisation, 10. 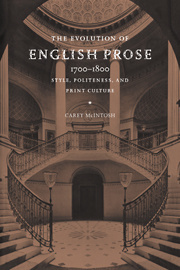 Style and rhetoric, Epilogue - language change.